+ Stella Maris +: Defending Vassula - Again! Once again the readers of "True Life in God" are being accused of various things because of their connection with Vassula Ryden. Vassula is attacked (there is no other word for it) by both Catholics and Orthodox. One Catholic used the word "schismatic"- presumably, on the basis of her Greek Orthodox faith. So this is the same for all Greek Orthodox Christians then? She has been attacked in the past because she was divorced and was then married in the Orthodox Church. This particular criticism is seldom heard now because it is deemed disrespectful to the Orthodox. They dealt with it according to their own Canon Law, and according to an agreement made between the Greek Orthodox Church and the Vatican there is to be no interference in each other's jurisdiction and rules. In any case such things are - as in the Catholic Church - confidential, so no one knows the facts of the situation except those who dealt with it. Nevertheless that has not stopped some people trying to use it against her. She was accused of being dishonest. No evidence was ever brought forward by anyone to prove this. She was said to be manipulated by the devil. At least three international exorcists of renown disagree. The writing is not "automatic" and one of Europe's leading experts on this matter, the exorcist Fr. Curty, has stated this in writing. Still, this has not stopped people from saying it is "automatic" often quoting other writers as though they have the answer even though they have never even met Vassula or examined her writings! Now we come to the Vatican and the Notification. This is discussed here. Since I have written about it before - and been ignored by some - I will simply refer you to that site. There are other areas of criticism answered here and here. The Patriarch of Constantinople has issued a statement from the Holy Synod condemning Vassula. Some Catholics have been quick to jump on this as a way of attacking Vassula. But why has this statement been made? It is known there is tension in the Orthodox Churches over ecumenism. Not so long ago, the Russian Orthodox Church was reconciled with the Russian Orthodox Church Outside Russia. The ROCOR is vehemently anti-ecumenical. It seems also that there are tensions in the Romanian Patriarchate and some in the Greek Orthodox Church do not want to move forward towards Rome. What are the "innovations" or "novelties" condemned by the Patriarch? Those who have read the messages will know that they can be nothing other than doctrines associated with Roman Catholicism. There is much in the "messages" about the Pope; there is mention of Purgatory and The Immaculate Conception - there is much emphasis on the Sacred Heart of Jesus and the Rosary is encouraged. There are other "novelties" which those who have read the "messages" will recognise. Certainly much Orthodox spirituality is also celebrated and promoted, including use of the chotki (for the Jesus Prayer) and the Divine Liturgy is spoken of in language that would certainly be acceptable to the Orthodox. It seems then, that there is much behind the Patriarch's statement. Catholics cannot agree with it if it is rejecting Catholic teaching. Of course anyone is free to believe that Vassula is not a genuine mystic, but justice - and Canon Law - demand a proper discernment. This is not a matter of someone who does not like "this sort of thing" trying to use the authority of the Church to support their own private opinion. I will say again, the Vatican has NOT condemned Vassula and we are free to read her writings and discuss them. I know some people do not like that, but they will just have to live with it. A priest has attacked Vassula on his blog. I do not mention his name or the name of his blog. He says Vassula and her followers are "litigious". I say honestly, I do not know what he means. I have asked for examples. I have been ignored. It is true we have had to resort to Canon Law but this is not wrong - or is it? He also said that Anglicans receive Holy Communion with Catholics. This has been allowed after permission was granted from the Vatican - for pilgrimages - in other words for a special event. We do not encourage intercommunion or inter-concelebration. We have a policy document explaining this. He says that Vassula promotes the "branch theory" of the Anglican Church - she does no such thing. That is a complete misunderstanding of the writings. I would like to invite anyone to debate any of these points with me with reference to the writings themselves. It seems only fair that those who want to criticise them should read them. There are those go quiet when this challenge is made - because so many critics have NOT read them or read them only selectively. Finally, I repeat something I have said more than once. In all these discussions I insist on the right to respect and charity. No one has the right to insult, denigrate and belittle another person. That someone claims to be having locutions or any other mystical experiences does not mean that he or she is fair game and can therefore be treated unjustly. This is not an appeal to Canon Law (though it is there); it is with reference to the Gospel itself. Thank you for responding to the Brighton blog which has in the past been severely, and rightly criticised along with another known as The Bones.. The work of serious academics has been attacked in an unpleasant manner. I hope you will continue to raise objections as shall I. The material emanating from the priest's blog to which you refer, and others in the area of which I am sure you are aware, is unacceptable. I hope you will scroll down to see the unfounded criticisms against academics which indicate a bitter mysogyny and is the sort of destructive infighting we average Catholics abhor. Any association with the Newman Society should be questioned and I hope you will do so. My perfectly reasonable comment to the blog in question seems to have been rejected and this is not unusual. That yours was accepted makes me wonder if you are an answer to my Lenten prayers that a priest will, cordially and with knowledge, reveal the bias, prejudice and anti-intellectual vitriol and misogyny to which we are subject from this part of the country. I continue to read in the hope that some priest will step forward. Serious academics have had little impact and been subject to sarcasm and unfounded allegations of heresy etc. Comments that support his view have appeared this morning whilst mine, and probably others. appear to have been censored into oblivion. Thank you. Please continue your good work. Great post Fr.John. I am unable to share your post via a wordpress button being absent. Would it be permissable for me to copy and paste your post to my blog instead and share it with my readers? God bless Vassula and TLIG and all who read them and believe. Jealousy may be at work. God is in control. Stephen please go ahead. I just came back from another city (not in UK) where I spoke about "True Life in God". Thes inspiring messages cannot be stopped no matter who does not like them, their effect is clear in the lives of those who are able to listen and open up to the Holy Spirit. Those who time and again say that they are not "orthodox" do not know what they are talking about because, as I say time and again, they do not read them or understand them. Thank you for returning to the blog in question with your excellent response. That blog has (unintentionally I'm sure) encouraged us to take a closer look at "True Life in God" rather than turn away. I would send a similar comment to the person but doubt if it would displayed. I hope he reads yours. PS. I have also learned how to spell misogyny! We ordinary Catholics very much regret what has been written in the blog you have replied to tonight. Others have found it a hopeless quest to deal with such sarcasm and especially when it is supported by a cleric with equal intolerance. "It's moments like these that I begin to understand why some quite reasonable clergy want nothing to do with traddies. They've discovered through bitter experience just how nasty people can be when mediocrity lays ownership to something which is not actually theirs and then somebody else comes along with a lace alb to spoil their Gothic party. Our little local problem is just symptomatic of the wider movement at the moment. When a local tat merchant becomes the sole arbiter of the traditional rites then you've got trouble. When a cleric believes himself to be the only proper interpreter of tradition in his area then you've got trouble." I have to admit to feeling confused as I have read most of the messages in TLIG and have been left with a feeling of the love of God for each of us. On the other hand, as a Roman Catholic I wouldn't want to do anything to disrespect the Church. I have read the other blog and Fr Abberton's and would like to say that Fr Abberton's has left me with a feeling of peace and charity to all concerned. So who is our neighbour? Did Our Lord mean immediate, within our Parish, country, world? I know what I have always believed and my view hasn't been imposed as it's from my heart. Let me say that the messages of "True Life in God" are not so easily understood. Let me explain. In order to really understand we have to be prepared for a "shift" in our thinking. I take the Ordinariate as an example. Is it a gift from the Holy Spirit? I believe so, and so do some Anglican readers of the messages. One has actually said that it is the "same as" the message of TLIG. I hope this helps. Becomning one with the Holy See (which is necessary for all) is not always about being labelled a "Roman Catholic". 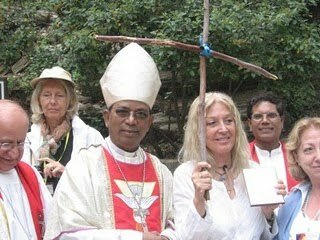 The Anglicans that are joining the Ordinariate are being united with the Pope, but it is not correct to say simply, "they are converting" or they are "becoming Roman Catholics". Something unique and historic is happening, but it opens the door to others who will come to "Rome". The label "Roman Catholicism" is necessary to designate who people are in the West, but we also have the label "Greek Catholics". Again it is not the same as the Uniate situation. The historical situation is different. God is bringing people together through TRUTH asnd LOVE. Humility and love are the keys to unity - as it says in the messages, not an enforced, "do this, say this, or else" type of approach. God's ways often surprise us - He is more patient, understanding and subtle than we are, and the subtleties can be seen in TLIG if we open our eyes. At the same time, there is much that RC's need to learn. We have to rediscover a real sense of wonder and reverence in our liturgy - something we can learn from the Orthodox. We all need a personal intimate relationship with Christ. The evangelicals (some at least) can encourage us in this - as well as a proper respect for the Word of God instead of allowing some scholars to dictate what we should accept or reject from the Bible. There is much more to say and I am probably not expressing it as well as I might. At the heart of TLIG is the Father's love for ALL His children and the desire of the Heart of Christ for unity - the unity prophesied in the Scriptures; the unity that brings peace and the defeat of evil. If only everyone understood this there would be no need for such writings. If these writings are from God it is because we need them (those who can accept this). God does not give us graces because we are worthy and good - He gives them because they are needed and helpful. Those who don't want TLIG are free to reject it, but that does not mean they are also free to attack those who do accept it. Where there is no humility and love (and I am still praying and searching for this! )there can be no unity. Basically we all need to ask, "what does Jesus want?" More arguments? I don't think so. For your information concerning the two blogs which have reached the height of invective recently. The matter has now been referred to a higher authority. The abuse of electronic media,in particular social networking which should be a force for good, has to end. Thank you for your gentle attempt to explain your position. It is just what we wished for our file as a fine illustration of our concerns. These blogs have been referred to the A&B Communications Office for consideration under the guidelines for social networking. Thank you Fr. Abberton. Your reply has been very helpful. I believe in unity. Our lord gave us so many exaples of caring for one another. I have been baptised in a particular church but that will never stop me from loving and caring about everyone in other denominations, religions, or those with no faith at all. I respect and have deep reverence for my RC church. Yet I will never stop feeling love for others because I believe God has placed those feelings in my heart. The TLIG messages are about love. They are about God's love for each of us. And if I am allowed to say - God wishes us to love him. I am unable to give fancy philospophical arguments. All I am able to do is to love God and love my neighbour. And my neighbour is everyone who lives in this world. I would like to say that I am unaware of what is behind some of these emails, but as a general statement I need to say that I am completely against the use of blogs or web sites to attack and denigrate people - whoever they are. I wrote a blog posting on this some time ago. I left one well-known blog precisely because of this kind of behaviour. On catholic blogs especially, it must not be tolerated. Strong argument is one thing, insults and bad manners are something else. I am not against "robust" argument but there is a line to be drawn and where it is crossed something needs to be said. I do not wish to be drawn into any "case" as such, but I have, more than once, made this point. Re: your commenter referring to the Oxford Newman Society. This has been confirmed and the blog will be informed. It is hoped that it will be displayed since the Society would not wish to be associated with undisciplined disputation. I decided to accept the above message although I have no idea what it refers to!!! My daughter believes she has a calling. She will not accept it is to the religious life as a nun but a vocation to the priesthood. You have written on this but I wondered if Vassula has received anything that might influence her? We are very concerned because,being involved in ecumenical work, we wonder if she will move in the opposite direction to the Ordinariate and join our Anglican friends? Catholic parents: I sympathise with you. Some years ago I spoke against women priests in a Catholic High School and found myself in hot water with one family whose 15 yr old daughter had convinced herself that she was being called to the priesthood. It is not unusual for Catholic teenagers to have something like this, and unfortunately because they hear of women priests this kind of ambition can form in their minds. It was not unusual for young Catholic lads to sense a vocation to the priesthood. The vast majority never got to seminary - or even if they did, most of them left before ordination. In other words - they grow out of it. As far as Vassula is concerned we have a policy in TLIG - no woman priest is allowed to join our pilgrimages unless she agrees to come in lay-clothes, and she is not allowed to participate in the activities reserved for clergy. They are welcome, but not as women priests. This is because the two main sections of the ancient Church - Catholic and Orthodox do not accept women's ordination, and never will. Those who think otherwise are dreaming. In fact the theological arguments against women's ordination have grown stronger whilst the arguments for it seem weaker. I suggest patience and prayer for your daughter. The other thing to say is that, theologically speaking, a vocation to service in the Church has to be discerned by and within the Church. Only when this happens can we be sure that a person has a vocation to the priethood. Also, God is not so cruel as to give a calling to the priesthood to a woman when He knows it will not be accepted. Going over to the Anglican Church is a bad option because, as we can see, it is in the process of disintegrating. I have a fuller discussion on the topic in my other blog, "Watching, Thinking and Praying" - see below on the right. On a another topic but partially inspired by this blog that had to defend Vassula again ,,, I sincerely wish that the Pontiff could authorize an order that would allow someone appointed as Bishop to defend the True Life in GOD people and even have bishops and priests of an order such as "True Life in GOD" just like there is an order called "Omnus Dei" or whatever that name is founded originally by Bishop or Father Scriven.. the saint encouraging for the saints of ordinary people. They have their bishop and they have their priests. I was wondering if the same could happen for the True Life in GOD people. I had also asked Archbishop Don Jolly Gabriel (who spoke at one of your conferences) if he would be open to that. I would like to know if the people of True Life in God would be open to this. David, I understand that he Pope met Vassula when she visited Argentina and was quite happy to do so. What this will mean in the future I cannot say. I guess he is a very kind and affable person so whether it was just his kindness or not we cannot know. He certainly did not forbid her to speak there or anything like that. As far as appointing a priest or bishop to work permanently is concerned, there are problems. It would first have to be recognised as a Catholic apostolate and I don't think that will happen. it is firmly ecumenical and is as Orthodox as it is Catholic. Secondly there are the Orthodox criticisms to consider. However, I would not be surprised to see something done in another way, perhaps with a retired priest or bishop, in an "unofficial" capacity. We will have to wait and see. The Pope has many things on his mind and needs all our support and prayers.